This is the night the champs will be crowned in nine divisions of Miami's annual Golden Gloves tourney. Winding up a three-night show, beginning this evening at 8 o'clock, will be the cream of the amateur fistic crop in this area. They're ready for the bell and you can bet there'll be plenty of leather tossed this night. Winners will be eligible not only for top awards, but will represent the Miami sub-district in the Northeast Oklahoma tourney at Tulsa Jan. 28, 29 and 30. In addition to the championship bouts, slated as in the past two shows at College gym, there will be a battle royal tonight between some of the hard-hitting smaller fellows. Four of last year's champions will be on hand to defend their crowns with possibly Norvel Trash, who went to the finals in thc Tulsa meet last year, the biggest favorite to repeat. Pidgeon Riley will be on hand to defend his 135-pound title as will John James in the 105-pound class and J. E. Cook in the 126-pound division. Trask in defending his 160-pound title will take on Bill Waddle, and is favored to win easily. Riley takes on another Indian boy, Ronnie McLemore of the Seneca Indian school, in what promises to be one of the best fights on the night's card. McLemore entered the finals by pounding out a hard earned decision over Floyd Rogers, of Miami. Riley moved up by taking a first round TKO over Arlo Stanton of Chelsea. John James, Miami, may have a rough time in taking Monkey Carey in the 105-pound division. Both boys entered the finals on TKO's. Carey ending his fight in :55 seconds of the first round and James ending his in 1:04 of the first. Cook, who represents the junior college, will take on Bill Whipkey, lanky boxer from Picher. At 147 will be a couple of hard hitting boys, Curtis Meyers and Lloyd Beard. The heavyweight division will bring together J. W. Moreland, Miami junior college, and Bud Parker, of Oklahoma Military Academy, Both are youngsters and it should develop into a good scrap before it in over. Two Seneca Indian school boys will battle it out for the 112-pound title, Benny Bushyhead and March Wind. At 118, Gene Flood, Chelsea, will meet Jim Rogers, Seneca, and in the light heavy division, Tub Logan, Commerce, will meet Julius Hecksher, also of Commerce. 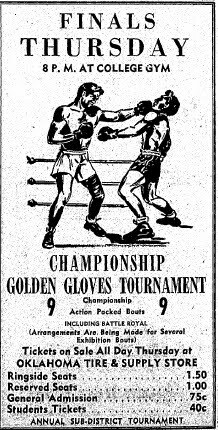 Source for advertisement - Miami Daily News Record; Miami, OK; Wednesday, January 21, 1948; p. 4. Source for article - Miami Daily News Record; Miami, OK; Thursday, January 22, 1948; p. 8.